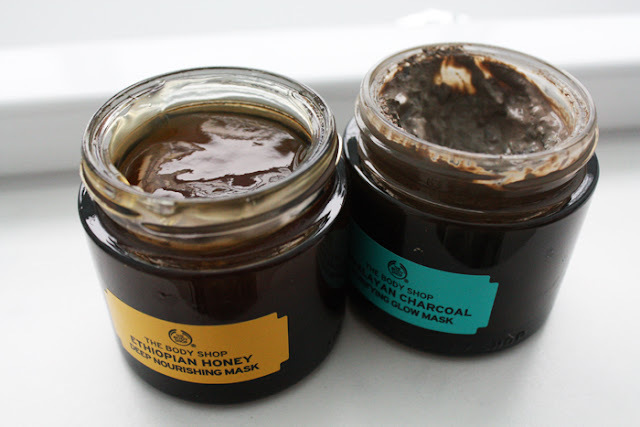 Himalayan Charcoal Purifying Glow Mask*-Out of the two masks I reviewed this one is definitely my favourite. It's 100 per cent vegan, contains charcoal, green tea leaves and tea tree oil. If your skin's being a bit troublesome, mine's been acting out something chronic lately, you will love this. It dries down to an almost scrub-like texture and when you wipe it away, your skin gets a bit of an exfoliation as well. As it is more on the abrasive side, if your skin is a bit drier or maturer, this mask might not be the one for you. Combination and oily-skinned peeps though, you're going to like this one. British Rose Fresh Plumping Mask*-Hi guys, my name is Albertine and I run a blog+shop called Pigment Studio. Side note: Go buy one of Albertine's chokers. They're beautiful. Sophie very generously gave me this mask to try out and review for you, so without further ado, here are my thoughts on this mask. I've used this mask about four or five times now and I can safely say it is one of the best wash off masks I've ever used! Not only does it make my face feeling really nice and clean but it really helps to hydrate and plump up my skin, leaving it looking amazingly glowy and fresh. Don't get me wrong, I do love a good mud mask but on days where I feel like treating my skin, without the hassle of wiping dried mud off my face, I reach for this mask. It's really refreshing and perfect for a quick 10 minute skin treatment before applying makeup and heading out for the evening. It's equally as perfect for when you're having a bath and want to quickly slap on a face mask and relax. Lastly, but certainly not least of all, the smell of this mask is AMAZING! Honestly, if I haven't convinced you to buy this mask and try it out for yourself, please go to your nearest Body Shop and have a sniff of this product at the least. Trust me. The smell alone may convince you. 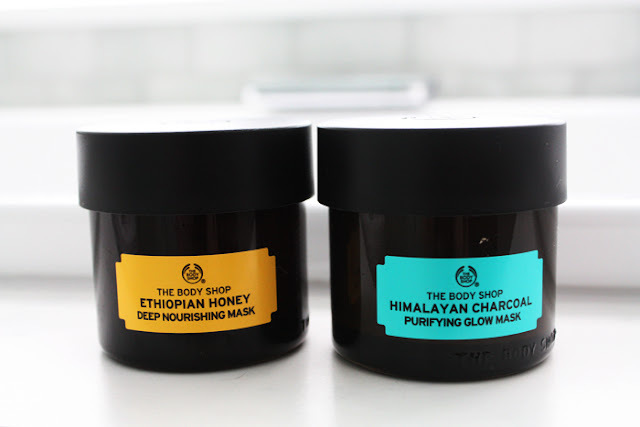 Ethopian Honey Deep Nourishing Mask*-One common misconception with combination-oily skin like mine, #blessed *ahem*, is that your skin needs less moisture. Sometimes combination skin is actually dehydrated and as a result it produces more oil. Not ideal. Anyway, where I am going with that tangent is that this mask is perfect if your skin's feeling a little bit moisture deprived or in need of something a bit gentler than the charcoal mask I reviewed. It contains community trade honey, marula oil from Namibia and olive oil from Italy. The combination of oils and honey results in your skin feeling a lot smoother and softer after you've removed this mask. Again, it's the perfect one if your skin's a little bit angrier because it is so gentle and soothing. I love how nourishing it is too without feeling heavy or thick when applied. Chinese Ginseng and Rice Clarifying Polishing Mask*-Hi everyone, I'm Emma from emmaetc where I mainly write about beauty and books, two of my greatest loves. Using the Chinese Ginseng and Rice Clarifying Polish Mask means you're on your way to achieving a smooth, fresh and brightened complexion. My skin often veers on the dull, clogged side, being very blemish prone, so this face mask seemed a great fit. When applied, it feels relaxing and quite cooling on the skin and should be left for around 5-10 minutes although I like leaving it for a little longer. This mask doesn't set or go hard at all really, and it's designed for you to be able to gently rub into the skin afterwards for exfoliating. I found it certainly polished my skin and made it appear brighter because the small exfoliating bits polished away any bumps or dead skin. I love these types of masks because my face feels super smooth afterwards as you get both the cleanse and exfoliation in there. Generally, I think this really makes a difference to the skin and makes makeup application easier in the morning. Paired with a glow-inducing cleanser, I definitely notice my skin looks brighter and it makes for the ultimate pamper session. Now for the exciting part, if you want to win a mask of your own, I am giving away one Amazonian Acai Energising Radiance Mask*. This giveaway will run until the 17th of October and I will announce the winner on my Facebook then. This giveaway is for my NZ readers only as the mask is in a glass container. I just don't want to risk sending it overseas and having it get smashed or wrecked in transit. To be in to win, enter through the Rafflecopter box below. Oh and if you're under 18, please check before you enter as I will need your address to send out the prize. Good luck! -Have you tried any of these face masks before? What did you think of them? *PR Samples. This giveaway is not sponsored however all the masks were provided for review, including the giveaway prize. All thoughts and opinions are our own. © Nana Wintour. Powered by Blogger.